Add a personal touch to your business or product with custom hang tags. 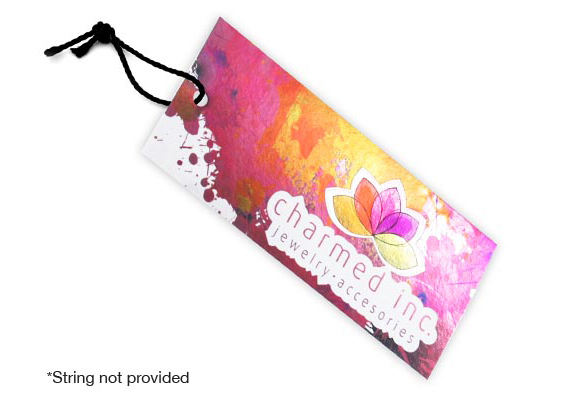 Our inline foil hang tags are great for attracting attention and recognition to your product. Include prices, description, tagline, business information or other useful details. You can select from hundreds of colors or choose just one color. With inline foil, it allows for any combination of foils added to your hang tag design. Fill the entire tag with foil or elect the areas. Custom hang tags can be for jewelry, clothing, gift baskets and more. The possibilities are endless. Inline Foil: Inline or Cold Foil is applied to the card stock prior to the ink. NOTE: Spot UV Gloss applied to back only will apply Full UV to the front. Please Select 1.5" x 3.5" 1.75" x 3.5" 2" x 2" 2" x 3.5" 2" x 4" 2" x 6" 2.12" x 5" 2.5" x 2.5" 3" x 3" 3.5" x 3.5"